At Fine Dental, our team of dentists, led by Manhattan cosmetic dentist Scott M. Fine, has been providing our patients with quality care for over 20 years. We pride ourselves on combining the latest dental technology with practical solutions for our patients. That is why, when patients come to us after experiencing multiple tooth loss, we recommend treatment with implant-supported dentures. 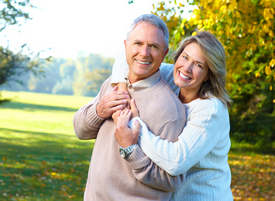 Dental implants give our patients in Manhattan a secure and comfortable anchor for dentures. The advanced dental implant treatment still allows patients the option of choosing between partial or full dentures. Bar-retained dentures: Bar-retained dentures are affixed to dental implants by clips on the dentures that fit over a metal bar. This metal bar follows the curve of the mouth and connects a series of dental implants. Ball-retained dentures: Ball-retained dentures are attached to dental implants with a series of ball shaped attachments on the dental implants that fit into sockets on the dentures. Whether patients use bar-retained dentures or ball-retained dentures, the denture itself will consist of porcelain teeth and an acrylic base that resembles the gums . Permanent dentures should be cared for the same as the natural teeth, with regular brushing and flossing, along with routine dental appointments. Removable implant-supported dentures should be cared for in a similar fashion to traditional dentures. It is not recommended that patients sleep with the removable implant-supported dentures in place. The dentures should be removed nightly for cleaning and the attachments should be thoroughly cleaned as well. Patients should also avoid eating hard, sticky food or candy as these foods may cause damage to the dentures. Implant-supported dentures offer a more stable and comfortable fit than traditional dentures. Patients will have no fear of an implant-supported denture shifting or falling out of place. In addition, patients with implant-supported dentures report an improved ability to chew and speak. Removable implant-supported dentures offer a secure replacement for lost teeth. However, for patients who are looking for an even more permanent restoration, there are other options available for dental implants. Patients can discuss the possibility of fixed dental crowns or bridgework that can be secured by dental implants. Don’t let adult tooth loss ruin your smile or compromise the health of your surrounding teeth or jaw bone. Dr. Scott M. Fine has the experience and technology needed to replace missing teeth with comfortable and secure restorations. Schedule an appointment with Dr. Fine to discuss the benefits of implant-supported dentures.